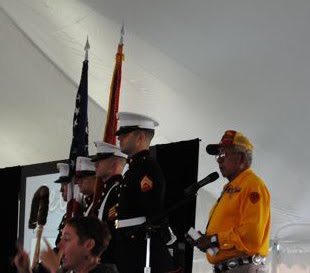 Yesterday we visited the Ganondagan Historic Site in Victor, NY to hear a Navajo Code Talker speak. I happen to be working on a caricature art quilt at the moment on democracy in action. Perhaps this made the experience all the more special. The 86 year old Navajo, Bill Toledo, was escorted to the speaking platform by a host of representatives from various tribes that had served in the US military. A Marine color guard stood at attention throughout Bill's hour long speech. The Code Talkers created a code during WWII out of their native language that was used successfully through out the Pacific arena. The Navajo who served as Code Talkers were able to convey information to troops in 30 seconds that had previously taken 30 minutes to code. This meant getting help in operations quickly where needed and saved many lives. The code was never broken. Bill stood quietly telling his audience the story of his involvement. He told us facts and let us do the interpreting - a bit like displaying a quilt and letting others take away their own meaning. Simple statements such as 'we lost 33% of our division in that operation' made it clear that he and his fellow Code Talkers lived through much and were true heroes. Only about 50 of these men are still alive today. It is a gift to be able to hear one relate firsthand about a most amazing contribution. 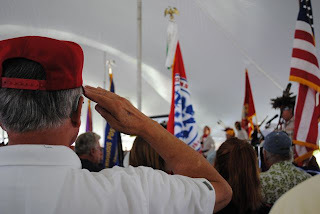 It was equally touching to be in the presence of the many veterans in the audience who snapped to attention almost instinctively when the flag was paraded. It is good to be reminded that we have many heroes in our midst and appreciate that they are all ordinary people who chose extraordinary action in a time of need.